Updated 3/25/2015 Cut 547. While Popo and her mother are looking at Gyariko’s goodies, Palme and the other child bandits are infiltrating the house. Somehow, Palme has wound up on a screen directly above Popo, when suddenly the pendant around his neck begins to make an odd jingling sound. He lifts it and shakes it gently, and suddenly it begins to glow with internal light, casting little dapples of bluish light on his face. Palme is momentarily hypnotized by the sight. Sequence numbers: A1 END [Popo’s face], B1 [hand with pendant], D1 [bubble inside pendant], E1’ and E1 [two layers of airbrushing adding reflections to the facets of the pendant]. This lot came with some interesting extras, including a complete set of END top layers: B6 [hand], C5 [pendant], D13 [bubble], E10’ and E10 [airbrushed reflections]. As the dougas are all partials, I’ve added an alternative scan of the A1 END cel with all the END layers replacing the start key layers. The background (just a featureless sheet of gray shading into black) is also original and matching. See the “Sketches and Backgrounds” gallery for a scan of the extraordinary autograph layout that came with this background. The pendant, as we’ve learned, is a keepsake that was made for the puppet by his first mistress, Xian, whose death he has never accepted. It was made to simulate a vial of crosskahla oil, the mystical substance that later becomes Palme’s life-support, courtesy of Koram’s gift. But it doesn’t actually contain anything other than something that looks like the magical oil, since Xian never fulfilled her quest to find a source. So why is it starting to glow and jingle now? 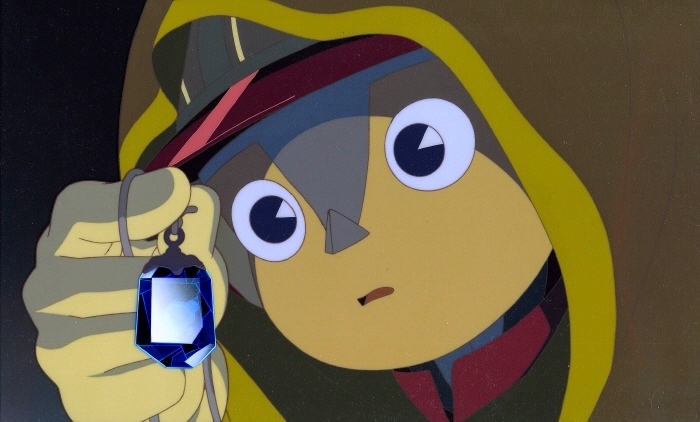 The moment is powerfully enigmatic, and a crucial turning point in the story, as Palme in short order drops the pendant through the screen, and it ends up in Popo’s pocket, setting up their first meeting. 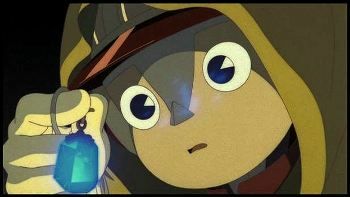 A possible explanation, suggested but never developed in the movie, is that Popo really is Xian in her next rebirth, and so the pendant is signaling that the soul of its creator is nearby.